English: Battle B-Daman: Fire Spirits! It is not uncommon to wish upon shooting stars. But for B-DaPlayers all around the world, what they seek is not for their wishes to be granted. Gazing upon what many would assume are just rocks shrunk to the size of a pebble by atmospheric entry and fallen to the earth, the fated ones see instead what are known as Strike Shots—powerful marbles originating from the vast and mystical outer space. After achieving triumph in the war against his ultimate foes, Yamato Daiwa continues his journey as a rising B-DaPlayer, looking to obtain a new power worthy of his improved battle gear. The exciting and awesome sequel to the first B-daman show! In B-daman Fire Spirits you can expect seeing the same cast of characters from the first showa and have them all put their skills to the test once again! I have to say that I didn't get to see Fire Spirits until much later on after seeing the first show, however when I did I was quite amazed at many aspects of it which I will try my best to explain in this review. The story follows in the steps of the main protagonist Yamato Delgado just like in the first show, and he hasn't changed a bit and is still all about battling tough B-daplayers (opponents) in the world. You can imagine Yamato's personality as someone like Goku, always wanting to become better and stronger to fight against stronger characters. As he also is all about the power of friendship and brings such positive vibes to everyone he meets. And just like in the first show, they enter the Winner's Tournament which is where all the best B-daplayers from all around the world come to enter to become the #1 B-daplayer. However Fire Spirits has a very good set of villains and their methods of dealing with Yamato and his friends makes the show's story darker than the first show in my opinion. In all honesty, I don't think the art is a all that super, but it is not bad either! It still has that in between old school & modern style feeling, however is definiely more improved compared to the first show. The sound I feel is a huge step up compared to the first show. In the first show all B-daballs (the shots that B-damans take) have the same sound, however in this show they actually have a nice variation of different sounds. Many share the same sound, however the sound feels much more fitting for the shots and you will clearly notice this when you watch the very first episode. With many of the original cast returning as well as new characters being introduced, the original cast has gone through a very nice change. Design wise I find their looks more fitting, regardless of whether some have a very small design change (such as Yamato) and some which have a very different and showing difference (such as Enjyu). The newly introduced characters also have a very good design and it all fits their personality perfectly as well. However there are some that could've stayed the same or didn't really need a weird looking design. I definitely think that with the different personalities and exciting battles that are being brought into Fire Spirits you can definitely have a good time by sitting down and watching the show. Of course I can see the show appealing more towards kids than adults, but by no means does this mean that adults could not enjoy it. If you like shows such as Yu-Gi-Oh! 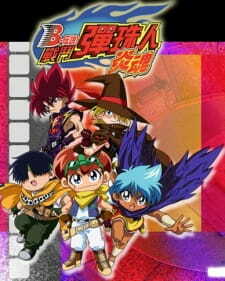 and Beyblade, then you most likely would enjoy watching B-daman Fire Spirits also! I might be biased because B-daman was a big deal and a huge part of my childhood like other shows such as Yu-Gi-Oh!, Beyblade and Pokemon which are definitely comparable to this one. However I think that if you come from watching the first B-daman show, I definitely believe that Fire Spirits is a huge step up and has its memorable moments to remember. Not to mention the interesting concept and addition of Strike Shots make the show much more exciting! However it does often make things quite predictable, you can definitely see what makes it so cool. Overall I give it an 8 as a sum up for all the points I've gone through and I believe it deserves it as a sequel as well as how good the show has been presented in terms of quality, length and enjoyment.